Air Canada welcomed a stellar group of its industry supporters to Malaparte at the TIFF Bell LightBox in Toronto last night (April 26) for a celebration – and there was certainly a lot to celebrate. And if that’s not enough reason to celebrate, Bureau pointed to the fact that Air Canada was celebrating its 80th birthday in 2017; its planes are being decked out in a new livery; it has turned in three or four years of profitability; and in 2017 it will be hiring 1,400 new employees. Oh, but that’s not all. As Air Canada moves into the second year of its three-year growth plan, the airline continues to add new routes and strengthen its increasingly important Toronto hub operation. 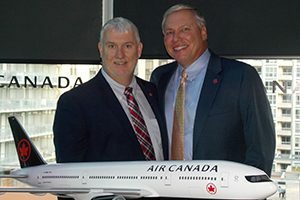 Last night, Air Canada offered details on its launch of service to Savanah, Georgia (May 1); Reykjavik, Iceland (June 21); and Mumbai, India (July 1); along with new services to San Antonio, Texas; Memphis, Tennessee; Berlin, Germany. In 2017, Bureau revealed, 90% of the new markets that Air Canada is adding will be international markets and that provides the carrier’s travel trade partners with an opportunity to introduce new international product to their clients. Stay tuned, Air Canada has a lot more planned for 2017… it’s going to be an interesting year. Pictured (l-r) are Bureau with William Miles, president and CEO of the Hilton Head Island – Bluffton Chamber of Commerce.